As a college professor, I enjoy the same extended breaks that many teachers do. Although I have taught and would teach summer sessions (and even winter inter-sessions), that is not likely to happen this summer. And, truth be told, I enjoy the breaks. I have an obligation to be available for work in my profession, and although I am available, I have no problem with having an abundance of “free time.” It is especially nice considering teachers are almost always working during the school year. There is always some work that needs to be done outside of class and that work often must be done at times others are traditionally off work on their weekends and evenings. In essence, we get our Saturdays and Sundays all in a row in the summer. When I am asked what day of the week it is, in the summer my answer will be a tongue-in-cheek, “Saturday,” no matter what day it actually is. Sorry/not sorry. But back to this idea of “free time.” Presumably, that is the time one enjoys when he or she is not otherwise obligated through work or some other responsibility that demands one’s time. In that respect, my summer is full of free time. It’s not all free, there are numerous things that are part of life that must be done - responsibilities and other things that take time - but I guess if one enjoys the freedom of when those things are done, it adds an element of freedom that I do not have during the school year. Even those things that I do outside the classroom that are largely up to me as to when I do them, they still have deadlines. For example, I still have to prepare for class before that class actually meets. And too often the only time available is on Saturday or Sunday or in the evening. If I am asked what day it is on a Saturday during the school year, and that Saturday happens to be one in which I am buried in paper grading, I am not quite so jovial in my response. Love my job, hate grading. Where was I? Oh yes, this idea of “free time.” I have some right now. I am using it to write this. I have been writing, and writing things like this, for a long time. It is not my job, per sé (it was when I wrote for a living), but it is certainly part of it. Now I write less and read more, but I always intend to write more when I have some time… some free time. So, while I am doing what many do for money, this is not a job and I am not getting paid. I’d be willing to bet that most poets write most of their poetry for nothing, that most musicians write most of their music for nothing, most painters paint most of their paintings for nothing, most photographers shoot most of their photos for nothing, that most art is created for the sake of art itself, that most of it never realizes a profit. Most of the time, the time used to create is literally “free time.” And, speaking for myself, it isn’t really work in the classical sense anyway. I like to spend my time during these long breaks doing both something and nothing. Downtime does not bore me, I do not feel any pressing need to always be doing something. But it’s also true that most of the doing nothing I do is doing something. Every summer for the past few I have taken an extended journey on my motorcycle - the last two summers included one that took two weeks and was several thousand miles. Some might call that a vacation and, to a certain extent it is, but it is a far cry from what most would enjoy and while mentally relaxing (again, not for everyone) it can be and often is physically grueling. Is it doing something? Is it work? I guess that all depends upon how one frames those terms, but it is clearly not a job. Perhaps one day I will figure a way of “selling” the experience - the story - through some medium, but right now that is not how I wish to spend my time. Creating it, yes - selling it, no. 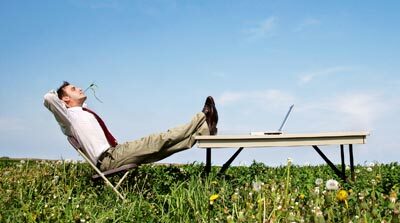 I have been around long enough to have known a few people personally who have entered “retirement.” Some of them had a tough time adjusting to all the “free time” that became instantly available. When one has worked a regular job for an entire adult life, anything more than a week or two break from the nine to five, Monday through Friday can be confusing, even intimidating. None, however, ended up saying, “screw this, I’d rather punch a clock.” They all adapted and some are doing far more now than they did when so much of their time was not “free.” I am faced with two months of free time left. 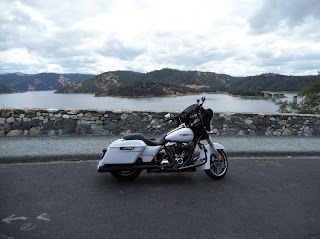 I have many things on my calendar, including another extended motorcycle trip, but I feel as though I need to be doing more of this, more writing. I have been meaning to write a couple of books, a memoir and a novel, both of which have been marinating in my head for some time. In fact, some of it has spilled out in written words, but none have lit fire, yet. This summer was going to be that summer. I will not put any artificial deadlines on either project - that’s not what it is about. And though I am likely to expose both to the possibility of publication, neither is being written with that goal in mind. Because my bucket-list 48-state motorcycle summer is being pushed back to next summer, this summer is the summer to get some things done. But, the time is still free and to put any such demands upon it diminishes its freeness. Therefore, this thousand or so words will have to suffice for now. They were indeed written during my free time. Since my first concert on December 2nd, 1978, I have attended literally hundreds of them. That first show, just days before I turned 16 years-old, was among the best. In fact, until my second concert just a short while later, my first show was simultaneously the best and the worst I’d ever seen. But there are other reasons as well, reasons that could not be qualified at my young age and with my limited experience. That first show, however and in retrospect, remains among my “top 10.” It stood the test of time. For my first concert I was fortunate enough to see Black Sabbath on their “Never Say Die” tour, the last tour before the band and lead singer Ozzy Osbourne parted ways. 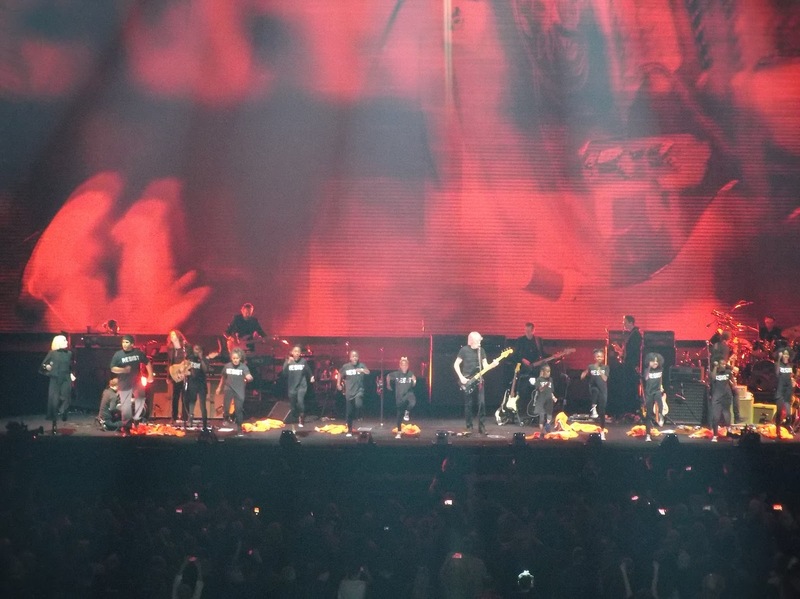 That, in and of itself, gave the concert an historic legacy, but it was even more than that. There was a little upstart garage band out of Los Angeles that was the opening act, a band that was beginning to make a name for itself. Named for the last name of the two brothers who founded it, that band is now rock legend - Van Halen. My second concert featured Cheap Trick opening for the Doobie Brothers and from then on I went to concerts whenever I could. I have seen bands that have come and gone, bands that have endured, bands that have reformed, bands that feature all and none of the original members and, sadly, too many rock stars who have since died. Some of those concerts were thoroughly forgettable and some left an indelible mark on my very being. A few have made it into my “top 10” list of best concerts ever. Before I get to the latest inductee into that top 10 list, there are some things one must understand about the list itself. First of all, there is no actual “list.” My top 10 list is simply an accolade paid to a particular performance that not only meets my rather lofty expectations, it exceeds them in ways that are unforeseen. I cannot know going into a show, no matter how high the bar, if it will be all that. Furthermore, do I not have any clear idea which concerts are on it; and there are very likely more than just 10. Be that as it may, when I am leaving a show saying to myself or to whomever I am with, “That was one of the top 10 best shows I’ve ever seen,” it is saying something. Last night I attended one of the top 10 best concerts I’ve ever seen. 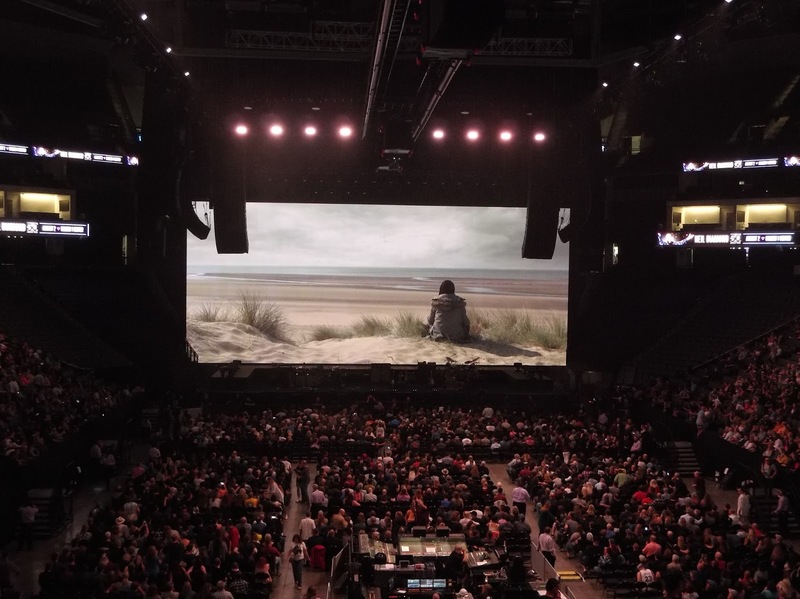 The Roger Waters “Us and Them” tour made a stop at Sacramento’s Golden 1 Arena and it was, as I commented to one of my old friends who will be seeing the same show in Las Vegas, almost beyond description. And, like any live performance, it could never be captured in mere words anyway, but this show was beyond even that. There are some personal factors that make it more profound than any particular performance at face value. First, it is important to consider that in my extensive concert going repertoire, I never saw Pink Floyd. Also, considering the version of Pink Floyd I most identify with is the David Gilmore/Roger Waters iteration and, since Waters played extensively from Pink Floyd’s catalog from Dark Side of the Moon though The Wall, I was, for all intents and purposes, at a Pink Floyd concert. Finally. Everything, the spectacle, the lavishness, the technology, the theatrics and all else that are hallmarks of a Pink Floyd concert were present last night. 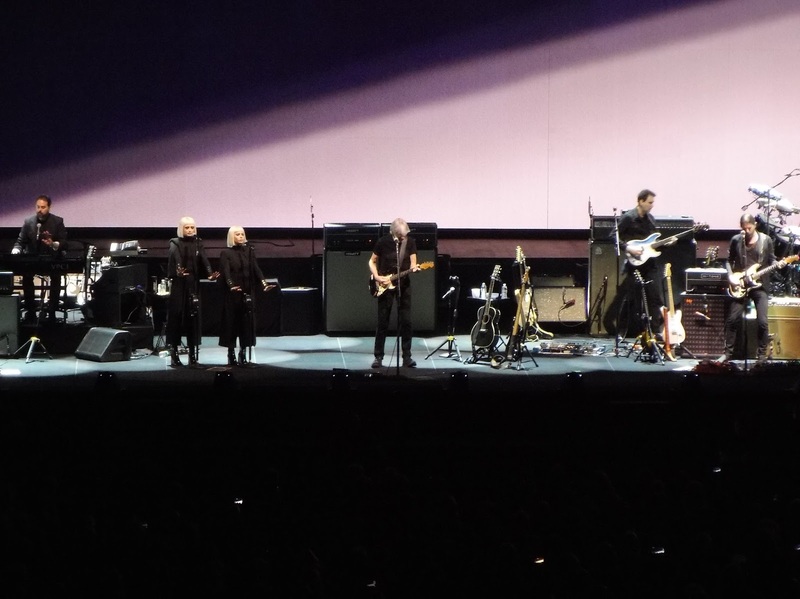 The musicianship was perfection embodied and the sound system was so crisp and so clear that I might have been wearing a pair of über-expensive, audiophile-geek headphones. 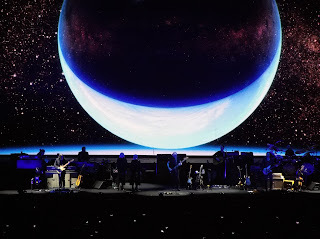 Furthermore, as art is best when it speaks, Waters went beyond the already socio-political themes of the tracks with visuals oriented to the events of today. Right here, right now. 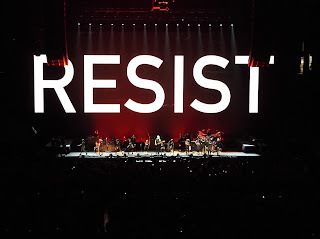 Indeed, the music, most of it written decades ago, was eerily prophetic, especially as interpreted in the live performance. 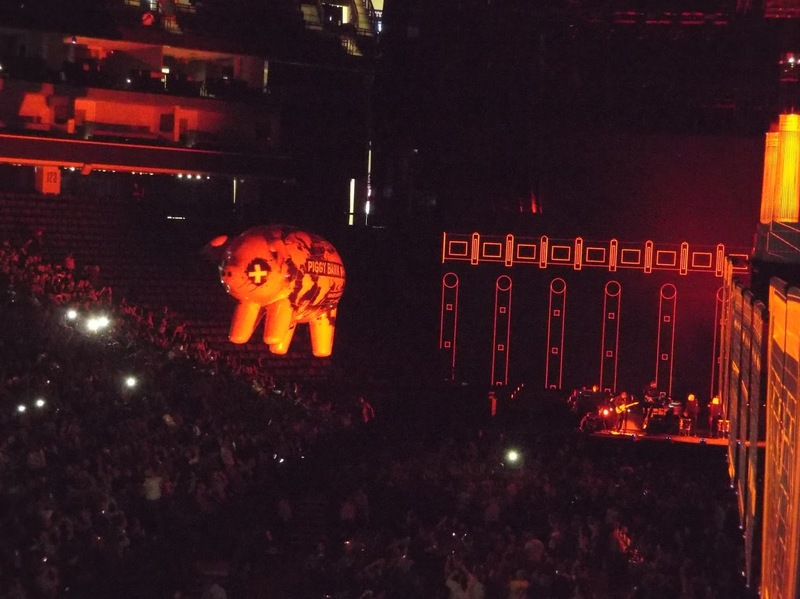 Although the audience was, arguably, not entirely of the same political stance as Waters, oddly enough the music appeared to trump (sorry/not sorry) the message it carried. 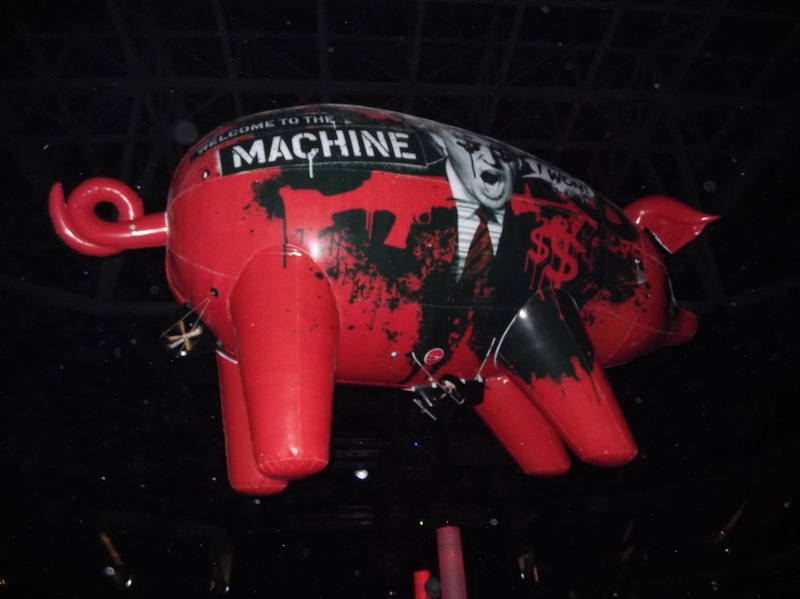 In other words, the music of Pink Floyd brought even those on the right back to a perhaps more idealistic time in their lives. It seemed to be enough, at least for those on the right whom I have a personal relationship with, to overlook the overt political (and, to be perfectly frank, anti-Trump) message. For me, the message through the art of the music along with the theatrics were all a seamless whole. I have had the distinct displeasure of going to a concert where the artist took a break from what I paid for (specifically, to hear music) to go off on a political rant. Even if it is an ideology I agree with, I do not buy these tickets to be held hostage and preached to. 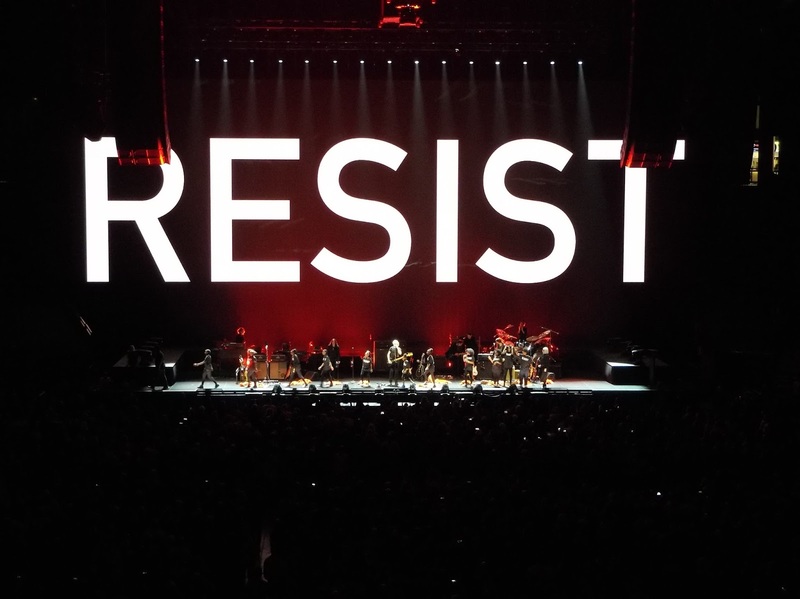 Waters did not do that, and I would say that his message, delivered through the music of Pink Floyd, was the best shot at gaining any adherence from the “other side.” While hopeful, I don’t know that even the skillful mosaic Waters wove is enough to nullify the polarization we are in the midst of. But one can hope. 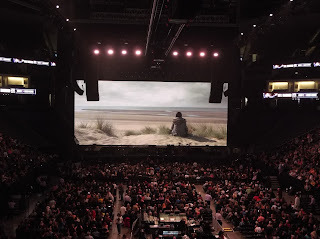 In the meantime, I was witness to what I missed in years gone by - a Pink Floyd concert that will go down as one of the top 10 concerts I’ve ever seen.